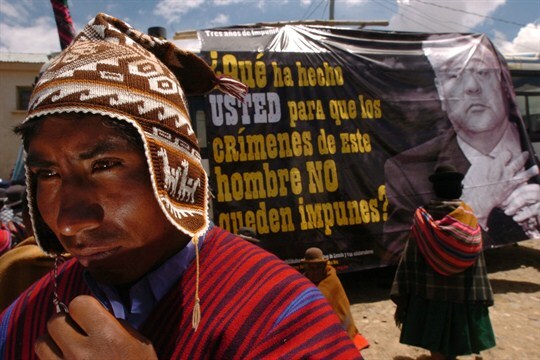 An indigenous man stands in front of a banner depicting former Bolivian President Gonzalo Sanchez de Lozada, Warista, Bolivia, Sept. 20, 2006 (AP photo by Juan Karita). After six days of deliberation, a jury in Fort Lauderdale, Florida, last week declared Bolivia’s former president, Gonzalo Sanchez de Lozada, and defense minister, Carlos Sanchez Berzain, guilty under U.S. law of extrajudicial killings committed in Bolivia 15 years ago. Damages of $10 million were awarded to the case’s eight plaintiffs, who all lost family members during the 2003 security crackdown on protests in Bolivia over a proposed natural gas pipeline running to Chile. Both Sanchez de Lozada and Sanchez Berzain have been living in exile in the United States since they fled Bolivia after the violence in what became known as the Bolivian gas war.